NEW YORK, Nov. 29, 2018 /PRNewswire/ — Newgioco Group, Inc. (“Newgioco” or the “Company”) (OTCQB:NWGI), a company providing regulated online and land-based gaming and wagering through licensed subsidiaries in Italy and Austria, and headquartered in Toronto, Canada, is pleased to report that leading gambling, betting, and gaming news agency AGIMEG – Agenzia Giornalistica sul Mercato del Gioco (“AGIMEG”) shows a surge in Newgioco online poker betting turnover resulting in significantly improved market share. Newgioco Group, through its wholly owned subsidiary Multigioco S.R.L (“Multigioco”), continues its accelerating growth trend in fiscal year 2018 with online poker betting in Italy gaining significant ground. Multigioco reported online poker turnover growing by 96% since January 2018. AGIMEG also reports that Multigioco has increased its market share to 4.17% in October 2018 (from 2.4% in July 2018). This press release contains certain forward-looking statements within the meaning of the safe harbor provisions of the Private Securities Litigation Reform Act of 1995. These statements are identified by the use of the words “could,” “believe,” “anticipate,” “intend,” “estimate,” “expect,” “may,” “continue,” “predict,” “potential,” “project” and similar expressions that are intended to identify forward-looking statements. All forward-looking statements speak only as of the date of this press release. You should not place undue reliance on these forward-looking statements. Although we believe that our plans, objectives, expectations and intentions reflected in or suggested by the forward-looking statements are reasonable, we can give no assurance that these plans, objectives, expectations or intentions will be achieved. Forward-looking statements involve significant risks and uncertainties (some of which are beyond our control) and assumptions that could cause actual results to differ materially from historical experience and present expectations or projections and the trading price for our common stock may fluctuate significantly. Forward-looking statements also are affected by the risk factors described in the Company’s filings with the U.S. Securities and Exchange Commission. Except as required by law, we undertake no obligation to update or revise publicly any forward-looking statements, whether as a result of new information, future events or otherwise, after the date on which the statements are made or to reflect the occurrence of unanticipated events. NEW YORK, NY / ACCESSWIRE / November 21, 2018 / Newgioco Group, Inc. (“Newgioco” or the “Company”) (OTCQB: NWGI), a sports betting and gaming technology company providing regulated online and land-based gaming and wagering through licensed subsidiaries in Italy and Austria, and headquartered in Toronto, Canada, today reported its financial and operating results for the third quarter ended September 30, 2018. Cash position remained strong at approximately USD $5.8 million at September 30, 2018, compared to approximately USD $6.5 million at December 31, 2017. Technological readiness for expansion into the U.S. sports betting market. “In the third quarter of 2018, which is seasonably a weak quarter for us, we again delivered strong year over year sales growth while continuing to invest in our cutting-edge sports betting platform, ELYS, a one-stop sports betting solution for licensed casinos and gaming retailers. On the back of this strong operational performance, the Company is increasing its non-GAAP betting turnover guidance to $325 million for the 2018 fiscal year. 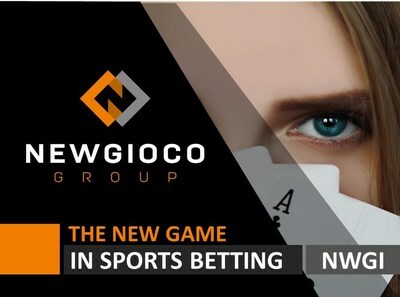 With industry-leading capabilities, Newgioco’s betting platform which offers a cutting-edge risk managed sports book with fully integrated land-based, mobile and online applications, built-in AI and BI technology and operator-centered gaming architecture, along with unique features and rich graphics we believe that are well-positioned for future growth in 2019,” stated Michele Ciavarella, Newgioco’s Chief Executive Officer. Raises USD $7.5 million in Private Placement Financing (June 2018): Newgioco announced the over-subscribed closing of its private placement of convertible debentures. To accommodate investor demand, the Company increased the size of the initial debenture offering from $1.5 million to $7.5 million. Together with the first two financing rounds completed in February and April 2018, the private placement of debentures, which are convertible into shares of the Company’s common stock at a fixed price of $0.40 per share, resulted in aggregate gross proceeds of approximately $8 million consisting of approximately $7 million in cash and approximately $1 million in conversions from debentures issued in 2017. Appointment of New Board of Directors (July 2018): Newgioco announced the appointment of three new independent board members, Russel McMeekin, Harold Wolkin and William Rutsey. Each of the new directors brings a wealth of global experience across a variety of different industry groups along with extensive experience in gaming operations and strategy. Entry into U.S. Sports Betting Market (September 2018): Newgioco announced its intention to enter the U.S. sports betting market following the repeal of the Professional and Amateur Sports Protection Act (PASPA) in May 2018. Newgioco aims to enter the U.S. gaming industry by combining its longstanding track record of success within Italy’s highly regulated gaming market and introducing its cost-effective, highly-scalable and customizable sports betting technology platform to a select partner network of U.S. land-based licensed gaming operators. Begins GLI Certification (September 2018): Newgioco announced that the Company began coding to obtain the latest standard of GLI (Gaming Labs International, LLC) certification of its ELYS betting platform in preparation to launch its U.S. sports betting business. Newgioco’s ELYS betting platform is a proven, powerful and efficient betting engine in the Company’s core Italian market. ELYS features seamless, integrated gaming account and transaction processing for B2B operators, and Newgioco believes it will resonate with casino operators in the U.S. when compared to other platforms and products being offered by certain established competitors. Launches Business Development Initiatives in U.S. Market (October 2018): Newgioco attended the 2018 Global Gaming Expo (“G2E”) held in Las Vegas, Nevada from October 8-11, 2018. At G2E, the Company meet with numerous U.S. based casino operators and demonstrated the newest release of its sports betting platform, ELYS. ELYS provides a fully automated and managed sports book, with an increased number of markets offered (both pre-match and live “in-game” betting), real-time risk monitoring with risk acceptance and bet monitoring tools, virtual sports betting, multi-channel payment methods and integration with multiple casinos and slot content providers. Newgioco Announces the Effectiveness of its Resale Registration Statement on Form S-1 (November 2018):Newgioco announced the effectiveness of its resale registration statement on Form S-1 relating to the resale of up to 3,892,379 shares of the Company’s common stock issuable upon exercise of warrants held by certain selling shareholders. Strengthens Management Team (September 2018): Newgioco announced several key additions to its leadership and management team. Key management additions included Elizabeth J. MacLean (Vice President Finance and Accounting), Alessandro Marcelli, (Chief Operating Officer), Ralph M. Garcea (Vice President Corporate and Business Development), Jay Cardwell (Interim Chief Financial Officer) and Bill Mitoulas (Vice President of Communications and Investor Relations). Recognized by CIOReview Magazine (October 2018): Newgioco recognized by CIOReview Magazine as ” 20 Most Promising Technology Solutions Providers for Casinos in 2018″. “Newgioco has made significant progress and achieved numerous operational, technological and financial milestones over the past year. We have built a strong, profitable and sophisticated gaming organization, while positioning the Company in 2019 to reach its long-term strategic goal and vision of continued organic growth in Italy and strategic entry into the U.S. gaming market,” stated Michele Ciavarella, Chief Executive Officer of Newgioco. Newgioco Group, Inc., together with its wholly-owned subsidiaries, is a fully licensed and integrated online and land-based leisure gaming operator. The Company conducts its business under the registered brand Newgioco primarily through its internet-based betting distribution network on its website, www.newgioco.it as well as retail neighborhood betting shops situated throughout Italy. NEW YORK, NY / ACCESSWIRE / November 14, 2018 / Newgioco Group, Inc. (”Newgioco” or the ”Company”) (OTCQB: NWGI), a sports betting and gaming technology company providing regulated online and land-based gaming and wagering through licensed subsidiaries in Italy and Austria, and headquartered in Toronto, Canada, announced today that its resale registration statement on Form S-1 (the “Registration Statement”) relating to the resale of up to 3,892,379 shares (the ”Shares”) of the Company’s common stock issuable upon exercise of warrants (the ”Warrants”) held by certain selling shareholders was declared effective by the Securities and Exchange Commission (”SEC”) on November 6, 2018. Although Newgioco will not receive any proceeds from the resale of the Shares, it will receive gross proceeds of US$0.50 per share upon the exercise of the Warrants. The Registration Statement, while effective, will allow the selling shareholders named therein to publicly resell the Shares subject to the prospectus delivery requirements of the Securities Act of 1933, as amended, in connection with any such resale. The offering of the Shares may only be made by means of a prospectus. The Registration Statement and prospectus may be obtained electronically through the SEC’s website at www.sec.gov. A copy of the prospectus relating to the offering may be obtained by writing to Newgioco Group, Inc. at Suite 701, 130 Adelaide St. W. Toronto, Ontario, M5H 2K4, by calling (416) 306-1771 or by e-mailing investor@newgiocogroup.com. This press release shall not constitute an offer to sell or the solicitation of an offer to buy any securities of Newgioco, nor shall there be any sales of these securities, in any state or jurisdiction in which such offer, solicitation or sale would be unlawful prior to registration or qualification under the securities laws of any such state or jurisdiction. Luca Pasquini, as our Chief Technology Officer and director. ROME – It was the first major hit of the year in the online gaming industry, with signs of a series of mergers and acquisitions in the coming months. Empire Global Corporation – a company based in Toronto and quoted on the OTC Market in New York – in a one million euro transaction, has discreetly acquired Multigioco Srl. a licenced online gaming operator in Italy, with five physical gaming centres in Italy made up of corners and agencies and more than 700 online web shops that produced over 71 million euro in turnover through 2013. Agipronews met the CEO of Empire Global, Michele “Mike” Ciavarella; an Italian-American entrepreneur in Rome outlining goals for Italy. Mr. Ciavarella, why has Empire Global decided to enter the Italian market? The Italian gaming market is a large, maturing and well-regulated market. We believe it is the right framework for a company like Empire Global, listed on an international stock exchange, seeking a safe and regulated gaming environment. The acquisition of a company such as Multigioco – with an excellent reputation and a young and capable management – is in our opinion the best way to enter the Italian gaming space. In addition to Italy, we have plans to expand into other countries in Europe and beyond. What are Empire’s first objectives in Italy? We want to be a forerunner in this market, for this – after Multigioco – we have ongoing negotiations with another major operator rich in human capital and experience, which is enthusiastic about the idea of having a foreign shareholder and capital sources. We plan to become one of the top five players in the Italian gaming space, always keeping in mind the need to offer a responsible gaming product to the consumer. We know that the most difficult part is yet to come; after the acquisitions, we will need to continue to invest resourcefully to reap the large rewards this market has to offer. Which brand will you use to manage your business in Italy? We will have three main areas of action: online web-based gaming; corners and agencies. We believe that we will maintain a specific brand for each sector, but we have not yet made a decision to that end. In any case, it will be clear to the consumer that the location is a part of the Empire Global group of companies. Our stores will be well organized and recognizable even from an aesthetic point of view. We plan to invest aggressively on this part of our business. Speaking of money, how much is the investment of Empire in the Italian market? Our forecast is to invest 50 million by the end of 2015, with at target of 100 – 120 physical betting locations as well as the development of our online web based business. Do you plan to participate in the tender for betting licences in 2016? Certainly yes, it will be mandatory for us, we will choose the areas in which to implement our existing network carefully. Are you worried about the presence of thousands of unauthorized operator centers in the market? Very much. We want to enter the market by following the rules, but we ask that those rules apply equally to all participants. To reassure investors, both the courts and the Italian authorities must ensure that laws are respected, otherwise, it will be increasingly difficult to attract international investors to Italy. Do you believe that the proposed amnesty for foreign operators will help the market in this sense? It is not just a matter of paying or not paying taxes, the key is to have an equal playing field for all. There should be no parallel network; all operators – even those that operate in the Italian market thanks to the amnesty proposal – must be transparent. https://www.newgiocogroup.com/wp-content/uploads/2018/06/slider3logo.png 549 487 admin https://www.newgiocogroup.com/wp-content/uploads/2018/06/NewGiocoGroup-logo_white-copia.png admin2018-11-06 13:18:582019-04-08 12:28:12Online gaming, Ciavarella (CEO Empire Global): "Acquisition of Multigioco first step; 50 million to invest in Italy"